School's out and, as every parent knows, children need an adventure. Taiwan's high speed rail wants to make getting there half the fun. The HSR has given its trains a big, bold makeover, complete with new uniforms for attendants and limited-edition tickets. The new look was designed by a local artist, and it's inspired by the decorative art found at the historic Wufeng Lin Family mansion. Hop on the high speed rail and it’s service with a smile as usual. But passengers may notice something a little different. It turns out that HSR personnel have gotten new uniforms. These green aprons with artistic yellow patterning are a lively update on the old dress code of the brown utility apron. The new aprons are patterned after “window blossoms,” an art form traditionally used to decorate windows. The pattern appears in the coach interior, too, as well as on 12 new HSR ticket designs. 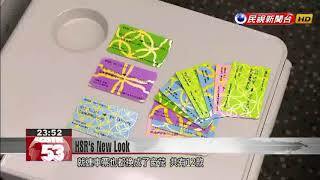 The limited-edition HSR tickets will be issued this summer only, and they’re aimed at families going on an adventure. I might get a blue ticket today and get a yellow one tomorrow. That makes each ticket more special. It makes me more interested in trying my luck and taking the HSR a few more times to see what color I get next. I think I would want to collect them because these patterns are truly very unique, very cute. Meanwhile, the TRA isn’t content to sit back and let the HSR monopolize the family travel market. Last summer, the TRA rolled out coaches decked out in a sweet livery and other family-friendly touches. Starting the end of July, the TRA will run extra train trips, so that more families can visit Taiwan’s beautiful sights and have lots of fun getting there.